I've always been a big fan of Rimmel but I have yet to try one of their mascaras in years. This mascara is going to be flying off the shelf because of it's resemblance to Macs Haute & Naughty mascara. Just like the Mac version this mascara is one tube with two different wands. Really there is one wand, two options to use it. One with more product and one with less. I really liked how much product came off on this wand. It created a very nice daytime mascara look on my eyes. I don't think it necessarily lengthened my lashes but it did a good day time mascara job. The only con I have about this wand is that it seems so long and my hand is so far away from my lashes. I understand that this is just the way it has to be to make the other wand work, but it still is a little odd and needs some time to adjust to. If you pull the black brush off you get a brush that has more product on it to create thicker fuller night time lash. I really like this brush. I put it on after the day on top of the pink brush's mascara and liked how it built up on top of the other one. I like the control I have with the brush and how it bulks up the lash. I have no cons about this mascara at all. I am glad I got this mascara. 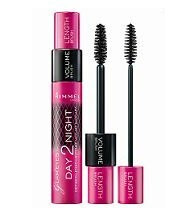 I think it is great to pop in a bag for day to night changes (hence the name) as well it is a great way to downsize a mascara collection, one mascara two looks, great idea. It is in expensive and works well. I hope there is a waterproof version in the future for me to try out.